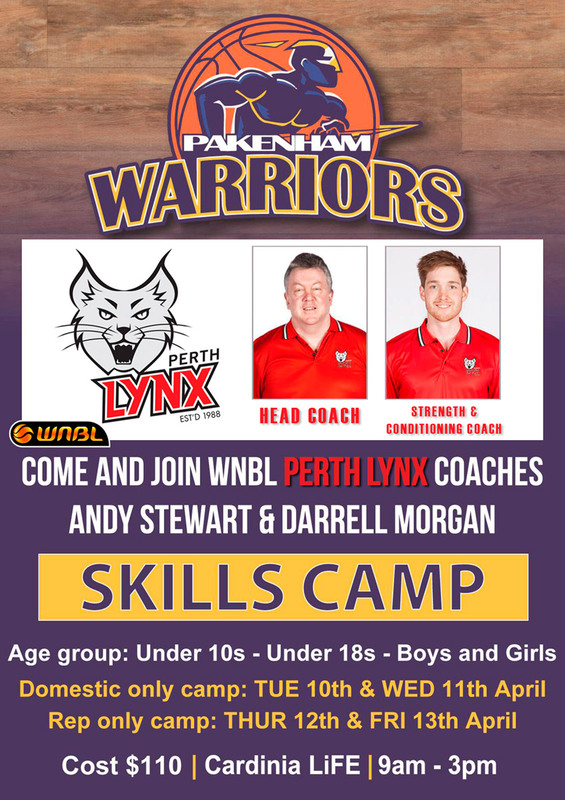 School Holiday Camp with Perth Lynx – Pakenham & District Basketball Association Inc. The Pakenham Warriors are hosting a 2 Day Basketball Camp for any and all basketballers, and also a 2 Day Basketball Camp for REP players. ALL Basketballers Camp – 9:00am – 3:00pm Tuesday 10th & Wednesday 11th April 2018. REP Only Camp – 9:00 am – 3:00pm Thursday 12th & Friday 13th April, 2018. Hosted by Perth Lynx WNBL Head Coach ANDY STEWART & Perth Lynx Strength & Conditioning Coach, Darrell Morgan. Open for all ages from 8 – 18.